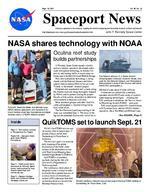 SPACEPORT NEWS Sept. 14, 2001 Page 2 Recognizing Our PeopleCristina Guidi selected for symposiumCristina Guidi was recently selected to participate in the National Academy of Engineerings (NAE) seventh annual Frontiers of Engineering symposium. This three-day event has been held annually since 1995 to provide an opportunity for outstanding engineers ages 30-45 who are involved in cutting-edge research and technical disciplines to learn about new and upcoming developments in other fields. The selectees participate in both formal sessions as well as informal discussions that provide them the opportunity to establish contacts and share new ideas and techniques. The participants are nominated by fellow engineers and selected from a field of more than170 applicants. Guidi was nominated by JoAnn Morgan, director of External Relations and Business Development. Cris Guidi has been on the frontier of some of NASAs most futuristic thinking and planning, Morgan said. She is a great representative for Kennedy Space Center and will be an outstanding participant in this symposium Guidi has worked for NASA for 12 years and currently serves as the advanced concepts manager for the Spaceport Technology Business Development office in the External Relations and Business Development Directorate. She is the KSC central point of contact for all advanced planning for human exploration initiatives and is responsible for the coordination and integration of numerous technology projects that relate to future human missions. The symposium is scheduled for Sept. 13-15 in Irvine, Calif., and will feature a variety of topics such as aeronautics, aerospace, civil systems, wireless communications, technology, and the human body.Christina GuidiProfessional development graduate honored Cris Guidi has been on the frontier of some of NASAs most futuristic thinking and planning.JoAnn Morgan Director of External Relations and Business DevelopmentNASA Administrator Dan Goldin presents a professional development certificate to Erik Denson, embedded systems lead in the Electronics Systems Branch of the Spaceport Engineering and Technology Directorate at Kennedy Space Center.Erik Denson was among 20 NASA employees honored on July 23 for their successful completion of the Professional Development Program (PDP). Denson is the embedded systems lead in the Electronics Systems Branch of the Spaceport Engineering and Technology Directorate at Kennedy Space Center. His primary PDP assignment was in the Chief Engineers Office at NASA Headquarters. At the PDP completion ceremony NASA Administrator Dan Goldin addressed the PDP graduates, reminding them that NASA is not about survival, it is about doing unbelievably tough things! Goldin challenged the graduating employees to take on tough goals. In referencing the class commitment statement, Goldin noted that if they are truly committed to operating as one NASA, NASA will soar. Participants in the PDP program are competitively selected by their Centers, and they engage in a yearlong intensive leadership development process that combines developmental work assignments, leadership development workshops, briefing by NASAs leadership, targeted training opportunities and individual coaching. The program broadened my knowledge of the various programs and projects of NASAs Enterprises and how each center supports the overall goals of the Agency, Denson said. I would highly recommend the program for anyone who is seeking to grow professionally and personally. Denson joined NASA KSC in 1990. He has 11 years of design and development experience on voice, data, video and communication systems critical to the processing and launching of the Space Shuttle. He received NASAs Exceptional Service Medal in May 2000 and the Manned Space Flight Awareness Silver Snoopy Award in 1995. In 1999, Denson served as the management intern to Center Director Roy Bridges. Denson holds a bachelors degree in electrical engineering from Howard University in Washington, D.C., and a masters degree from Polytechnic University. Page 4SPA CEPORT NEWS Sept. 14, 2001 n side e ather recastingrely on data from the Spaceports weather monitoring system, which includes 23 systems with a total of 900 sensors, as was reported in last weeks Inside Weather Monitoring feature in Spaceport News Were fortunate to have the most sophisticated weather monitoring system in the world, but even so, we are still challenged by the complexity of factors affecting our weather here, said Capt. David Beberwyk, Range Weather Operations Flight Commander. We constantly strive to improve the accuracy of our forecasts because so much depends on them. The data is also used by the NWS Spaceflight Meteorology Group (SMG) at Johnson Space Center (JSC) to make forecasts for the Shuttles on-orbit operations and landings at the Shuttle Landing Facility and alternate U.S. landing sites. Unless the group determines the Shuttle can land safely if theres an emergency, the Shuttle wont launch, Many workers at KSC are unaware of our role because we are located in Houston. Because the Shuttle Flight Director is here, having a group of forecasters the director can talk to face to face makes sense, said Frank Brody, chief of the SMG. KSCs Weather Office, run by John Madura, coordinates weather support activities with the 45th Weather Squadron and SMG and defines requirements for NASA operations. The Squadron and the SMG coordinate their forecasts during the Shuttle launch countdown to provide space program managers at KSC and JSC with a clearer understanding of impending conditions. The worst thing you can do is give managers conflicting forecasts, Madura said. Forecasting is an art as well as a science. When you have multiple conditions coming into play, forecasters debate the issues to come up with the best forecast. An ongoing series of Range Weather System equipment upgrades is helping to make forecasting at the Spaceport more of a science. Forecasters are also being given a clearer picture through work being done by the Applied Meteorology Unit (AMU). The applied research group, which is based at the ROCC, was formed by NASA, the Air Force and the NWS to develop and transition technologies for improved monitoring and forecasting. The Squadron is set to support weather forecasting for the Kodiak Star launch set at press time for Sept. 17 from the Kodiak Launch Complex, Alaska. Squadron Launch Weather Officer Jim Sardonia worked with the complex to upgrade its weather monitoring system for the launch.Winnie Lambert and Dr. Frank Merceret of the Applied Meteorology Unit discuss a complex local severe weather event depicted in radar data. 5 th Weather Squadron discuss the weather outlook for the day. Pictured from left are Bill Roeder, gt. Grippon, Lt. Crenshaw, Capt. Beberwyk and Tony Guifridda. Ed Priselac, Shuttle launch weather officer, and Capt. Beberwyk, standing, view weather data via the Range Weather Operations computer systems. Jim Sardonia, 45th Weather Squadron launch weather officer, works at the weather console at the Kodiak Launch Complex Control Center in preparation for the Kodiak Star launch. Page 5 SPACEPORT NEWS Sept. 14, 2001 Potato growth factor holds promiseMashed, fried, boiled, or baked is how we like eating potatoes. They are the largest vegetable crop grown in the world. Because we have them in abundance in the U.S., we usually dont give a second thought to how they grow. However, the Dynamac Corp.s research scientists, in cooperation with NASAs Advanced Life Support Program at Hangar L, have a different take on the spuds. In line with NASAs future space exploration vision, Dynamacs Dr. Gary Stutte, a plant scientist, and Neil Yorio, a research scientist, both in the Advanced Life Support and Gravitational Biology division, have taken the study of potatoes to a new level. Several generations of a redskin variety of potato were grown in a lab to study their candidacy for growth and consumption in space. The research included growth rate, energy and space consumption and crop yield. During the research, a growth factor produced by the potatoes themselves, called a Tuber Induction Factor (TIF), was discovered. TIF is a growth hormone in the potato that regulates growth of potato tubers. When the potatoes are harvested, the fluid used during growth is retained and reused for subsequent generations of potatoes. The research team found that the next generation of plants develop tubers faster because of the TIF, and produce less leafy vegetation. A 21-day cycle in the first generation becomes, in essence, a cycle representing 42 days of growth in the next generation, and so on. The discovery of this TIF hormone in potatoes has led the Dynamac research team, with the full support of NASA at Kennedy Space Center, to apply for and receive a patent on the process for producing a vegetative and tuber growth regulator. The growth regulator could be used to produce certified virus-free potato seed stock that could be directly planted using commercial seeding equipment. The use of a tuber growth regulator could increase seed potato production by 15 to 20 percent, and decrease the time to harvest by 20 percent, Stutte said. This process could be used for long-duration missions, such as a mission to Mars. The goal is to learn how to manage this natural compound efficiently and use it effectively to get less volume and more mass, reduce the cost for water and resources, and reduce the growth cycle. During the study, small potato plants grew hydroponically in a specially lighted and temperaturecontrolled incubation facility in the Hangar L annex. Once the plants show signs of tuber growth, they are transferred to the Hangar L Life Sciences facility and placed in special trays inside a facility called the Biomass Production Chamber. The leafy green vegetation is exposed to light on top, while the roots remain under a cover in special trays containing a solution of water and nutrients necessary for growth. The underground stems, called stolons, develop small seed tubers, and when they develop into potatoes, they are harvested. Several generations of potatoes have grown over a period of time in this research chamber and the result is diseaseand pesticide-free potatoes harvested every 21 days. Dr. Raymond Wheeler, a NASA plant physiologist who is working closely with Dynamac on the study, is also lead for the Food and Crop Systems Research Element for NASAs Advanced Life Support Program. He believes the more we understand the physiology of potatoes, or any crop, the better we can manage them. The more we can understand the influence of growth regulating factors, such as the TIF, the better we can manage the systems for life support applications, he said. In the case of a mission to Mars, we have to ask ourselves questions regarding what the life support options are and what they will cost. One of the real driving factors is what the energy requirements will be for lighting. In our present studies with potatoes, our goal is to try and gain the most efficient use of space and lighting.Plant hormone spurs production Harvested potatoes are allowed to dry  real weight attained for comparison with past and future harvests. Potatoes are then analyzed for their nutrient and elemental composition. Roots and stems are recycled and used in subsequent growing cycles. Nutrients are extracted from leafy vegetation and reused. Small tuber seed potatoes are reused for seed stock.How potato parts are processed The use of a tuber growth regulator could increase seed potato production by 15 to 20 percent, and decrease the time to harvest by 20 percent.Gary Stutte Dynamac plant scientistAbove, Chansi Williams, a Tuskegee University summer intern, examines a potato plant for growth. At left, Rick Toendle, a research chemist, performs an analysis for Tuber Induction Factor (TIF). TIF is a growth hormone in the potato that regulates growth of potato tubers. Dynamac Corp. and NASA are working to isolate the factor so that it can be used to promote potato growth during longduration space flight and commercially. Page 6SPACEPORT NEWS Sept. 14, 2001 John F. Kennedy Space Center Managing editor. . . . . . . . . . . . . . . . . . . Bruce Buckingham Editor. . . . . . . . . . . . . . . . . . . . . . . . . . Kathy Hagood Editorial support provided by InDyne Inc. Writers Group. NASA at KSC is located on the Internet at http://www.ksc.nasa.gov USGPO: 633-096/00065Spaceport News Spaceport News is an official publication of the Kennedy Space Center and is published on alternate Fridays by External Relations and Business Development in the interest of KSC civil service and contractor employees. Contributions are welcome and should be submitted two weeks before publication to the Media Services Branch, XAE-1. E-mail submissions can be sent to Katharine.Hagood-1@ksc.nasa.govHispanic Heritage Month will be held Sept. 17 through Oct. 15. Activities scheduled during the monthlong celebration of Hispanic Heritage include a luncheon on Sept. 25. The theme is Paving the Way for Future Generations. The luncheon will feature guest speaker Orlando Figueroa, Ph.D., Mars program director at NASA Headquarters in Washington, D.C. It will be held at the Debus Conference Facility from 11a.m. until1 p.m. Figueroa, who was born in San Juan, Puerto Rico, obtained his bachelor of science degree from the University of Puerto Rico, Mayaguez Campus. Figueroa completed advanced multiple studies in mechanical engineering at the University of Maryland. Dan Goldin appointed Figueroa to his current position as Mars program director May 1. Throughout his distinguished career, Figueroa has received numerous awards for outstanding performance and group achievement. Tickets for the luncheon are $13 per person and are available from the following individuals: Pedro Carrion, 7-0845; Wanda Petty, 7-9165/75; Lydia Del Rio, 7-2575; Rosaly Santos-Ebaugh, 7-8402; Joe Tellado, 7-6064; Luis Moctezuma, 7-6595; Pete Rosado, 1-3648; Henry Bursian, 1-3870; Luis Saucedo, 1-5969; Lina Rosad, 7-9383; Jose Lopez, 476-4052.Hispanic Heritage to be celebratedCombined Federal Campaign to beginHarbor Branch marine biologist Sandra Brooke shows the Oculina species that gives the Oculina reef its name. NASA shared its hydrophone technology and its robotics lab expertise with NOAA during a study of the reef.SHARE ...(Continued from Page 1)This years Kennedy Space Center Combined Federal Campaign (CFC) will officially open with a kick-off rally in the Training Auditorium at 9 a.m. Oct. 1, and run through Oct. 31. The slogan selected for this years campaign, United We Care, represents the generous giving spirit of the federal workforce at KSC. All NASA employees are invited to attend the kick-off rally to learn more about the Combined Federal Campaign and where their contributions will go. The Campaign is the time for NASA employees to reach out and support less fortunate people in the local community, our Nation, and around the world. Last year, Kennedy Space Center federal employees generously contributed more than $260,000 far exceeding the campaign goal of $220,000. KSCs goal for 2001 is $250,000. Guest speakers at the kick-off rally will include representatives from local charities who will relate first-hand how KSC contributions really make a difference. Todd Arnold, of the NASA International Space Station/ Payload Processing Utilization Division, has been designated campaign chairperson. More details on the campaign will be included in the Sept. 28 edition of the Spaceport News. with the Spaceport Engineering and Technology Directorates Development Integration Lab, participated in the study. They brought their expertise to the table with other NOAA partners, including the Harbor Branch Oceanographic Institution. This project is just the beginning of what we believe will be a fruitful new marine research partnership for NASA KSC and NOAA, Dr. Gilmore said. Were here on the ocean. Its a natural. Dr. Gilmore pointed out that the exploration of outer space and the seas hold similar difficulties and that NASA has partnered with NOAA for many years on weather monitoring. The Link Project was set up in 1999 to encourage technology sharing between NASA and NOAA. A technology-sharing Link symposium is planned for spring. Among the many benefits to NASA of participating in the Islands in the Stream study:The opportunity to fine tune and expand the prototype hydrophone technology  which eventually be offered for commercial licensing  by using it in a new environment. The prototype was developed using Center Director funds and will be used to study the effects of Shuttle launches on fish populations around the launch pad.The chance to demostrate the technology in front of representatives from a variety of universities and government agencies.On-the-job ROV training for the robotics specialists working with NOAA ROV expert Lance Horn. Because the KSC robotics lab will soon be inheriting a large ROV from Ames to use in addition to the smaller ROV the lab already uses, the experience is invaluable, Van Meter said. In addition to sharing the hydrophone technology with NOAA, the KSC group contributed their expertise in solving daily operational challeges. We couldnt pull off such a project without the help of NASA and our other partners, said Andy Shepard, assistant director of NOAAs National Underwater Research Center.